One of the biggest problems with having a lot of props, is the need to trigger them. Store bought props usually come with cheap photo sensors that never really work well. PIR sensors work pretty well if you can shield them from excess sources of IR, like direct sunlight. A third option, one that tends to be quite expensive, is the use of a floor mat switch. Floor mat switches are at their simplest form two conductive materials arranged in some manner to allow the conductive components to remain separated until weight is applied. (Someone steps on them) While the weight is applied, the conductive components make contact and complete the circuit. 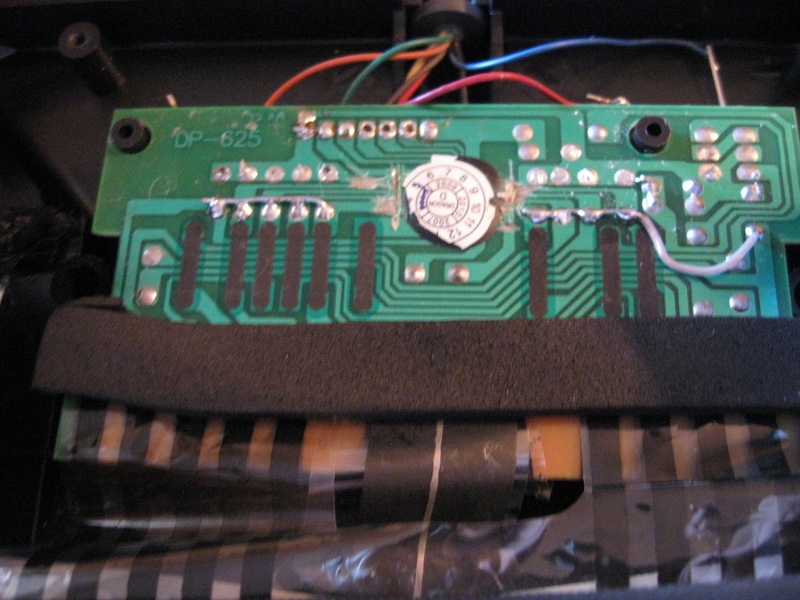 After the weight is removed, the contacts again separate and break the circuit. This makes for a pretty reliable guest sensor, as the mat is not affected by sources IR and false triggering is pretty unlikely. As I mentioned before, the biggest drawback to the mat switch, is the cost. Most mat switches are designed for use in industrial equipment for safety purposes, and are therefore rated for heavy usage. One night a year doesn’t seem to justify the ~$200 expense. One day as I was leaving the movies I saw a group of kids playing Dance Dance Revolution (DDR), and it hit me. There are tons of copies of DDR out there, and there are millions of cheap imported mats to work with your home entertainment system. A quick search of ebay found 2 Chinese import lower quality mats for $20. At $10 a piece, thats MUCH MORE suitable for a one day a year use. Hacking the mat turned out to be a pretty simple task, as I had expected. 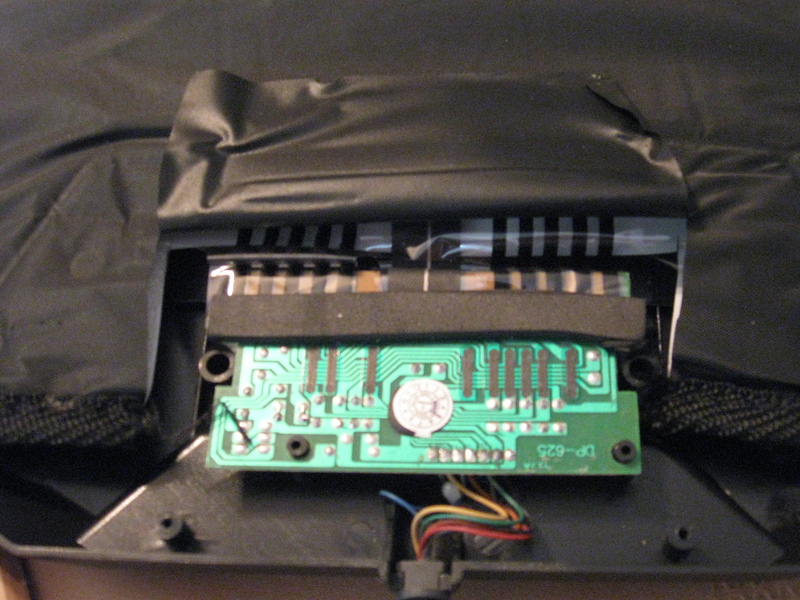 The controller electronics are located in a black box at the top of the mat. Opening the box, on the model of mat I purchased was as simple as unscrewing 6 screws on the back side. From there I was able to get a good look inside the mat. The low cost DDR mat, is at its heart two sheets of thin plastic, with carbon traces printed on them, separated by a thin sheet of foam similar to that used in packing fragile materials. The foam layer is punched with numerous holes under each “button”. The bottom layer acts as a ground plane and when pressure is applied the foam compresses allowing the top and bottom layers to meet, making contact. This change in resistance is then fed to a specialty chip located on the PCB that converts the contact to a signal usable by the video game system. While it is certainly possible to decode that signal and use it without altering the mat it would add more expense and therefore not acceptable for this application. For my needs I didn’t really need separate signals from the individual buttons. I just wanted the whole mat to act as a giant switch. For a while I toyed with the idea of taking the columns of the mat individual switches giving me a way to detect direction but the mat is actually small enough that i decided that wouldn’t be to useful. I broke out the Multimeter and started mapping out the lines from the various switches on the mat. The board contained a row of 0.1uF disc capacitors likely used for denouncing the controller circuit. I was planning on doing debouncing in software so I removed the capacitors and used their solder pads to tie all of the switches together, this was accomplished by taking a small piece of bare copper wire and soldering it across all of the connections. The mats connections were split to two sides of the board so this actually required two pieces of bare wire, and a small jumper to connect them. Once the individual switches on the mat were bridged I attached two of the original wires from the mat cable to the pads for the contact, one to the ground plane, and one to a trace leading to the now bridged contacts. I then took my multimeter and set it for continuity testing, and attached it to the other end of the cable. It immediately started behaving oddly. I decided this strange behavior has something to do with the controller chip still being in circuit. so, I took my razor knife and carefully cut all of the traces leading to the chip, without damaging the traces needed for and of the switches. ( Ok really, technically i accidentally nicked the ground lead and had to move my ground wire form its original location to another location, but as long as you are careful you wont run into that problem. 🙂 ) After disconnecting the chip, the multimeter returned to its expected behavior. With no pressure on the mat the mat read an open connection. Once I pt pressure on one of the pads, the continuity tester beeped, and resistance dropped to around 1500 – 600 ohms depending on the amount of pressure applied. 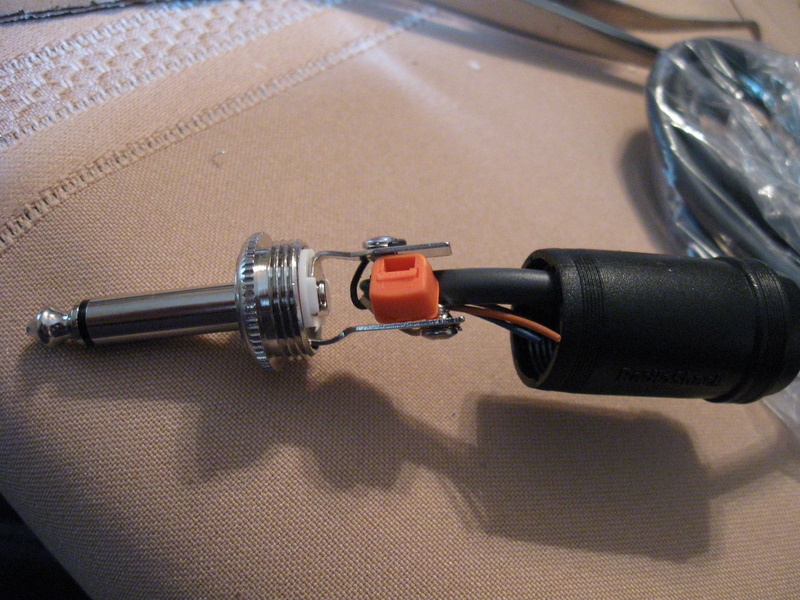 I then decided, while I had the mat open, and i had extra wires in the cable, I would add in an LED for future use. This was simple enough, I drilled a 5mm hole, pushed in the LED, and soldered two of the cable wires to the LED. I then closed up the box, and now have a low cost mat switch that can be attached to anything. Finally in place of the stock Playstation console plug the controller came with I placed a 1/4″ mono phono jack plug (Radio Shack: 274-1539). To accommodate the smaller controller cable, and maintain some strain relief for the VERY small wires inside, I also zipped on a zip tie and trimmed it. I have been using these plugs for dry contact prop triggers for the past few years and found their performance to be very good. Their overall size makes them easy to work with, and they are durable. I had originally started out using some proprietary plugs that I found at radio shack, but decided they were not as easy to work with. An added benefit of the 1/4″ plugs is that pre-made 1/4″ extension cables are easy to find, and allow me to add additional distance from the prop being controlled in moments. This flexibility is VERY handy. WARNING!!! DO NOT USE THIS SWITCH FOR HIGH CURRENT, OR HIGH VOLTAGE APPLICATIONS!!! Hook it to a low voltage relay to power more power hungry applications. Your mileage may vary, the author of this article is NOT responsible or any damage to property, personal injury, or any other problems that arise from using this hack. Do you think it is possible to use something similar to a wii fit board as it is just a big switch itself I think. Iam try to do this as well. I used a scream mat but was not getting the switch to work all the time. The wii fit board uses weight sensors, like in a digital scale. it would not be as simple to do this with.